Amino acid sequence derived from mouse ADIPOQ (NP_033735.3) (Met 1-Asn 247) was expressed, with a C-terminal polyhistidine tag. The secreted recombinant mouse ADIPOQ comprises 241 amino acids and has a calculated molecular mass of 26.4 kDa. As a result of glycosylation, the recombinant protein migrates as an approximately 30 kDa band in SDS-PAGE under reducing conditions. 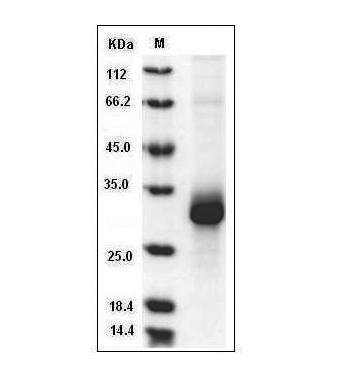 Fig.SDS-PAGE analysis of Mouse Adiponectin protein, His Tag. Always centrifuge tubes before opening. It is recommended to reconstitute the lyophilized Mouse Adiponectin protein, His Tag in sterile ddH2O not less than 100µg/ml, which can then be further diluted to other aqueous solutions. Lyophilized Mouse Adiponectin protein, His Tag product should be stored desiccated below -20°C. Upon reconstitution, the protein should be stored at 4°C between 2-7 days and for future use below -20°C. For long term storage it is recommended to add a carrier protein (0.1% HSA or BSA). Please prevent freeze-thaw cycles. Adiponectin (ADIPOQ), or 30 kDa adipocyte complement-related protein (Acrp30) is a protein secreted by adipose tissue, which acts to reduce insulin resistance and atherogenic damage, but it also exerts actions in other tissues. Adiponectin mediates its actions in the periphery mainly via two receptors, AdipoR1 and AdipoR2. Adiponectin influences gonadotropin release, normal pregnancy, and assisted reproduction outcomes. Adiponectin, a beneficial adipokine, represents a major link between obesity and reproduction. Higher levels of adiponectin are associated with improved menstrual function and better outcomes in assisted reproductive cycles. Unlike other adipocytokines produced by adipose tissue, adiponectin appears to have anti-inflammatory, anti-diabetic, and anti-atherogenic properties. Several clinical studies demonstrate the inverse relationship between plasma adiponectin levels and several inflammatory markers including C-reactive protein. Adiponectin attenuates inflammatory responses to multiple stimuli by modulating signaling pathways in a variety of cell types. The anti-inflammatory properties of adiponectin may be a major component of its beneficial effects on cardiovascular and metabolic disorders including atherosclerosis and insulin resistance. Additionally, it is important factor in chronic liver diseases and chronic kidney diseases. Some cancer cell types express adiponectin receptors. Thus Adiponectin may act on tumour cells directly by binding and activating adiponectin receptors and downstream signalling pathways.